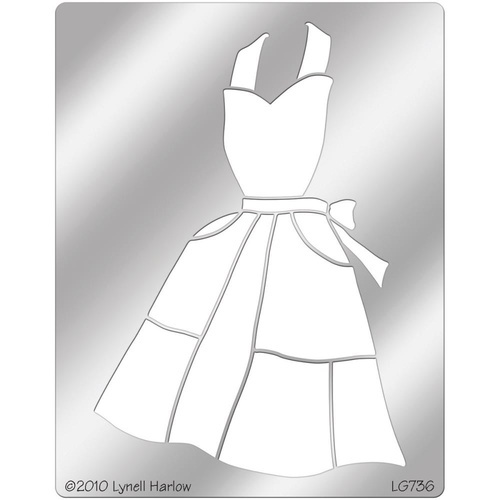 Apron stencil would look wonderful on cards, scrapbook pages and other paper craft projects. 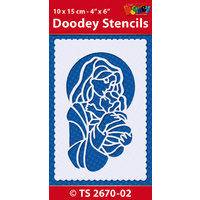 You could use these stencil designs on any type of project, embossed, they look great on square cards, stenciled the make great designs on boxes etc. Try them with glitter gel/paste, embossing paste and inks to create unique stand out images. 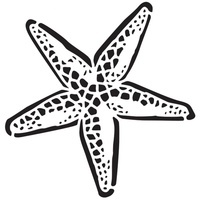 Manufacturers Description: Stampendous-Dreamweaver Metal Stencil. Perfect with inks, dyes, chalks, acrylics and watercolors! To emboss, secure the stencil to the front of the paper with removable tape, then place the paper, stencil side down, against a light table. Push the paper into the illuminated design with a medium tipped stylus or burnisher. To add color by stenciling, leave the stencil in place and use a small stencil brush to rouge or stipple color through the stencil holes. This 7-1/4x5inch package contains one metal stencil.